Pack of dungeon tile cards I’m working on. I used Decopatch Glue to cover a standard pack of cards with some heavy duty high gsm silky matte paper stock. Then I laid the black down over A4 pencil using a 0.5 permanent fine liner and sharpie combo for contrast in line strength. The colour was applied with Letraset ProMarkers which blended nicely with the black ink giving a nice finish to the stone. This might develop into a stand alone game or just be a useful way for me to carry a Dungeon in my pocket. The Vikings are coming ! A lone Irish Curaidh, (Champion) and a group of four Fianna, (Hearthguards) survey the advancing Viking lines of Hirdmen, (Hearthguards) and Bondi (Warriors). 3 Crusader Miniatures Irish figures. (With 2 non Irish subs), Lancelot from Footsore Miniatures and a random Saxon from the Gripping Beast plastics range. The Curaidh and Fianna have been cut down in the kill zone and utterly defeated. The Bonnachts, (Warriors) of the village step up to the mark to defend their homes. Bonnachts vs Bondi clash of the Warriors. A nonchalant Warlord, his jeering band of Hirdmen armed with Dane Axes and a berserker bear bring up the rear. The Irish Bonnachts push for advantage the Viking Warlord falls back to cover. More Hirdmen rush to close the gap. On the flank the Irish Kerns (Levy) armed with slings destroy the Viking advance. A great sorcerer inspires the Irish to victory on the field of battle this day ! 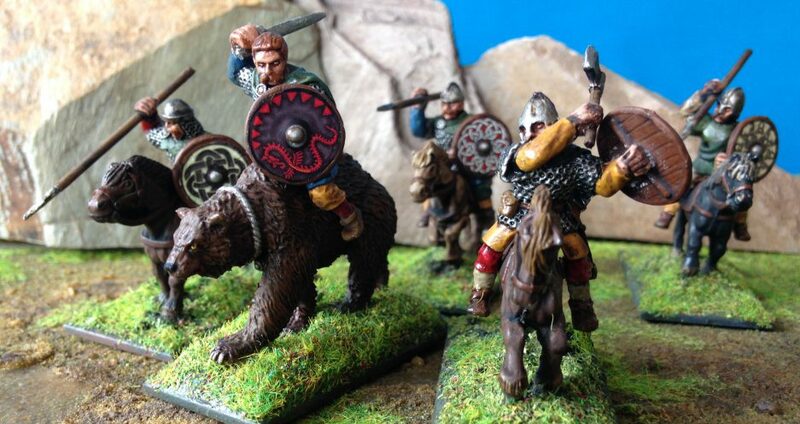 My Troops, Irish Bonnachts and Kerns, consist of Gripping Beast plastics from the Dark Age Warrior set. They were the very first army painted and were originally fielded as a Welsh war-band. They have been subbing as the Irish for some time with the addition of a band of warrior war dogs. The sorcerer is Merlin from Footsore Miniatures.